As many of you may know, I learned of Foodgawker earlier this week. I knew that it was a popular food photography website, but that's about it. I realized anybody with a blog can submit pictures that are reviewed for approval as long as the pictures are a certain size. I decided to submit a couple, and my green tea macaron picture was (amazingly) approved! :) I'm going to try to submit a few pictures every week to try to build a gallery on Foodgawker! So, first, I would like to welcome those of you who may have stumbled upon this blog through Foodgawker. I'd also like to thank all of my supporters who have been sharing this site with their friends and loved ones. I received a lot of amazing encouragement this week, even from strangers. I hope that I can continue touching people's lives with my passion for food and the stories I have. In honor of the green tea macaron post, I decided to make another green tea dessert for today! Mochi is a rice cake made with glutinous rice flour. It has a very chewy and slightly sticky texture. It's normally filled with a red bean paste. Sometimes you can find mochi filled with ice cream (and it's heavenly). I opted to try something different. 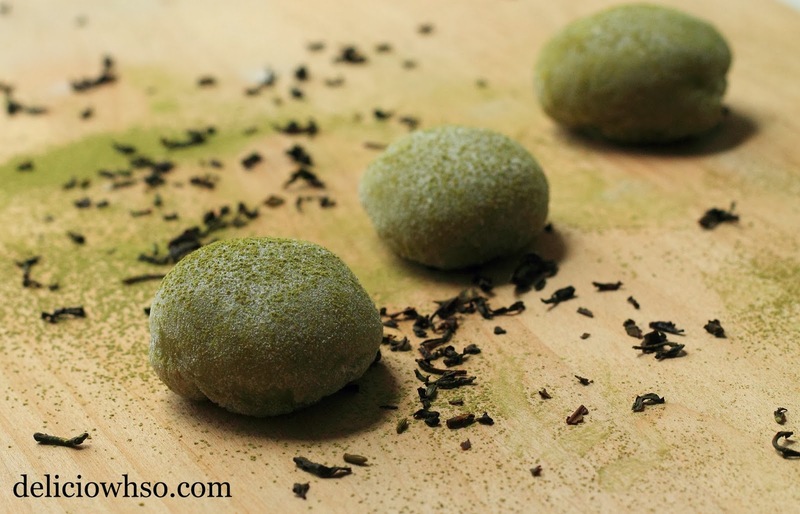 I made some green tea custard and made small green tea mochi bites. It's a bit easier than making mochi ice cream, since the custard is able to hold up well and doesn't melt as quickly. 1. In a medium bowl, whisk green tea powder, flour, and half the sugar together. 2. Put the milk and the remaining sugar in a pot and whisk together. Heat on high and bring to a boil. 3. Whisk yolks into the flour mixture until smooth. 4. When the milk boils, pour slowly into the eggs while whisking. 5. Pour the mixture back into the pot and mix on very low heat until it thickens and bubbles. 6. Pour the custard through a sieve to remove any clumps. 7. Pour the custard onto a plastic wrap-lined cookie sheet to cool completely. 8. Once cool, pour into a bag and pipe into quarter-size circles onto aluminum foil. 9. Place in the freezer until completely frozen, about 2-3 hours. 1. In a microwave-safe bowl, pour rice flour, sugar, and green tea powder. Whisk it together to combine completely. 2. Slowly add water and mix until there are no pockets of flour. 3. Cover the bowl with plastic and microwave for 3 minutes. 4. Mix after the 3 minutes to disperse heat as evenly as possible. 5. Heat in 30 second intervals for another 1.5 minutes. 6. Remove from the microwave and allow to cool for about 2 minutes. 7. Sprinkle a thick coating of corn starch, potato starch, or rice flour onto a cutting board. 8. Pour the mochi onto the board and dust the top with starch. 9. Place starch on your hands (the mochi is super sticky). Carefully (it will be hot!) roll the mochi into a log that is about 1.5 inches in diameter and 10 inches long. 10. Cut with a sharp knife that is dusted with the starch into 1/2 inch thick medallions. 11. Coat slightly with the starch and flatten out to about 3 inch diameter circles. 12. Place the frozen custard in the center, and bring together the edges in the center. 13. Pinch the edges closed, and place into a mini muffin cup to hold. 14. Serve! If you want to save them for later, wrap well and place into an airtight plastic container in the freezer. Allow the mochi to thaw about 10 minutes before serving, so that the filling is soft.